What is META-Health? - META-Health Academy. What is META-Health? - META-Health Academy. META-Health is a revolutionary approach based upon a natural science to understanding how our thoughts (unconsious), emotions (feelings) our physiology (organ-brain) and behaviours are fully integrated with and actively creating our health, personal development and well-being or dis-ease and degeneration. META-Health also importantly helps us to remove the fear of our bodys (organismic) responses and can explain and demonstarte how and why many of symptoms labelled today as dis-eases are actually a part of a complex and regenerative (restorative) and sometimes evolutionary process. 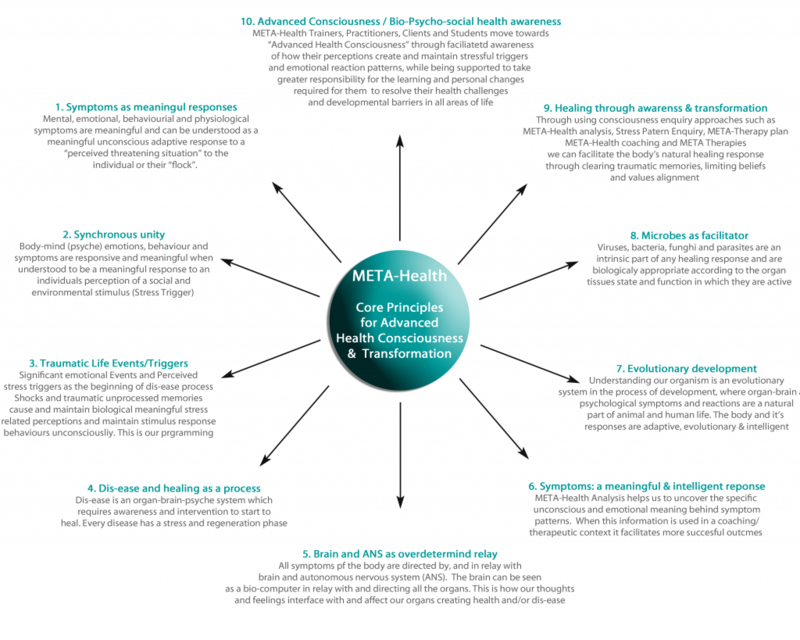 META-Health is based upon a natrual scientific framework founded on empirical evidence emerging from more than 40 years of Brain CT Scan and research. It gives us all an epi-genetic, evolutionary understanding resulting in a complete biological, psychological and social meaning of any illness. It has 10 main principles and redefines our understanding of health, dis-ease, healing and personal development today. According to the science behind META-Health, there is not only a mind-body connection, but actually a very precise organ-brain-psyche-social (behaviourial) relationship. Each brain area and relay corresponds to a specific type of experience i.e. brain stem and all the organs directed by the brain stem are usually associated with the ingestion,assiilation and elimination processing of information associated with survival just like the digestive system. i.e. 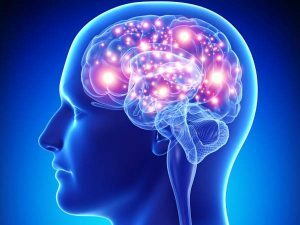 Each brain relay within a brain area corresponds to a specific organ tissue and a specific conflict or trauma and an environmental-social experience. In my case (Robert) I had a kidney nephrons health issue (Nephrotic Syndrome) age 2.5 to 18 yrs which caused me to retain fluid and mobilize proteins from muscle tissue. The meaning of this dis-ease programme and corresponding symptoms were associated with feelings of abandonment and isolation to better enable the body to cope in a felt isolation. In the modern world the body holding on to water doesn't make sense. If we change our thinking to how could this symptom be meaningful from an evolutionary perspective. Water is 2nd in the physiological hierarchy of needs. In archaic time, when water was a sccarce resource being abandoned/isolated left alone in the desert so to speak it could mean the end of water supply which is potentially life threatening. Hence Nephrotic Syndrome being a a natural bio-logical survival programme that started with an abandonment/isolation shock where the individual suddenly felt lost and unsupported. For me the trigger was being lost in Edinburgh for 2 hours age 2 years of age. Since discovering META-Medicine at age 35 I have been able to put togther many missing pieces of my health jigsaw and resolve many health issues. 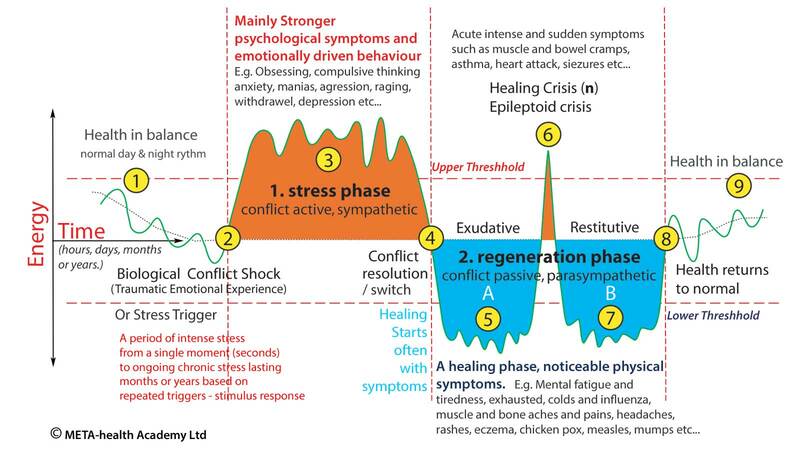 If we experience a conflict shock or stress trigger, an event that is unexpected, and momentarily dramatic and emotional, then our organism reacts with what we call 'dis-ease process' and symptoms like cancer, eczema, diabetes etc. 'Stress' has often been cited by various medical experts as a major cause of ill health. Meta Health takes our understanding of stress to a state-of-the-art level, where specific types of emotional stress can be seen to have an effect on specific organ-brain relays, thereby affecting the whole of the organism bio-psycho-socially (at all levels). This knowledge is absolutely revolutionary because it allows us to understand specifically how any dis-ease processes begin and which therapies are most likely to be useful. But this is just the beginning. META-Health and META-Kinetics takes our understanding even further. Why is this so important? Well, just imagine how much more precise enquiry can be if we understand the exact organ-mind-brain-social and behaviourial relationships. Additionally, META-Health explains the process and phasing of any dis-ease cycle and the two phases of any health issue, so therapies can be applied far more efficiently and successfully. Finally, because we understand the cause, meaning and process of thoughts, feelings and symptoms, we can therefore support the body mind and brains natural healing mechanisms instead of working against them. For the first time, META-Health, META-Kinetics and META-Vision can provide Coaches, Therapists, Holistic and Energy Practitioners, Health Professionals and our clients with precise understanding, Models and methodologies unparalleled skillsets to support healing and personal development on bio-logical, psychological, social and behavioral levels and provide unqiue answers to health questions. The META-Health Academy Professionals Trainers and Consultants were the first META-Health Independent Health Consultants and Master Trainers in the world able to offer root cause Analysis, META-Health Coaching, META-Therapy and Health Coach Training and certitification both in the UK and Internationally.